We had company for dinner last week and we made the most amazing grilled salmon! I knew when I saw the recipe that it would be wonderful and it was more than just wonderful...I can't even begin to think of an adjective to describe it! When I saw the recipe I mentioned to my daughter what I was making...she laughed and told me that they were talking about making a Mojo de Ajo that weekend....I guess they have made it many times...where have I been? Obviously they never shared with me. But, Aly, at Cooking in Stilettos did...and I have been doing a happy dance all week! You might be wondering just what Mojo de Ajo is, well, per Aly and Rick Bayless, it is liquid gold...and, I might add, not the Beverly Hillbillies' kind of liquid gold! This liquid gold is made by slowly roasting garlic in the oven...but not by itself, in a good quality olive oil! Aly said to try it, enjoy it, and thank her later...."Thank you, Aly!" The Mojo de Ajo is only the first part. On this evening, it was paired with seafood and not just any seafood, a gorgeous filet of wild King Salmon laying on a bed of Yukon potatoes, a spring onion and then topped with thyme. Aly adapted a Rick Bayless recipe for this wonderfully grilled dinner and mojo. When I saw it, I knew I had found the recipe for Blogger CLUE. The theme this month is grilling and Cooking in Stilettos is the blog I was assigned...It has been a delicious month! As I perused Aly's blog I was constantly distracted from the theme....the Southern Meatballs was a tempting appetizer and the Cherry Sangria looked so refreshing....but, as I mentioned, I was a magnet on the Grilled Salmon with Mojo de Ajo! Peel garlic and place the whole cloves in a baking dish (8" X 8"). Sprinkle the salt over the cloves. Pour the olive oil over the peeled garlic. Place in the oven and bake for 45 minutes. Remove from oven after 45 minutes and add the lime juice, lime zest, and the red pepper flakes. Place back in the oven for 20 minutes. After 20 minutes, remove the pan from the oven and using a potato masher, mash the garlic. Let the mixture cool slightly and pour into a jar. Refrigerate immediately. The Mojo de Ajo will keep in the refrigerator for about 3 months as long as the mashed garlic remains under the oil. Preheat the grill to medium high/high setting. Place the potatoes in a 4-quart pot. Cover with water. Bring to a boil and cook potatoes until just cooked through, approximately 25 minutes. Drain. Cool potatoes completely. Peel the potatoes, slice into 3/8" slices. Potatoes may be cooked a day ahead. Cut six pieces of foil, each about 12" X 24". Lay the foil with the dull side up. Fold in half to mark the middle. Open and spray each piece with cooking spray. Place 3 to 4 slices of potato in a row, down the middle of the sheet of foil. Spoon 1 tablespoon of the Mojo de Ajo over the potatoes, sprinkle with salt and fresh ground pepper. Place the spring onion on the potatoes. 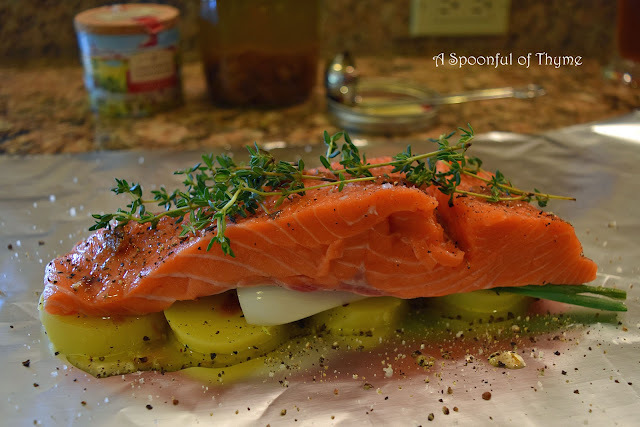 Place the salmon filet on top of the onion, if using. Drizzle another tablespoon of Mojo de Ajo over the salmon. Sprinkle with salt and fresh ground pepper. Place several sprigs of thyme or your preferred herb on top. Repeat for the remaining pieces of salmon. Seal the package by bringing the two end pieces of foil together and folding twice. Fold the sides inward twice to create an airtight package. Slide the packets onto a medium-high grill and cook for 10 to 20 minutes depending upon the thickness of the salmon. Remove from the grill and place on individual plates, along with several lime wedges. Let each guest open their own packet, squeeze with lime, savor and enjoy! This was a memorable meal!! 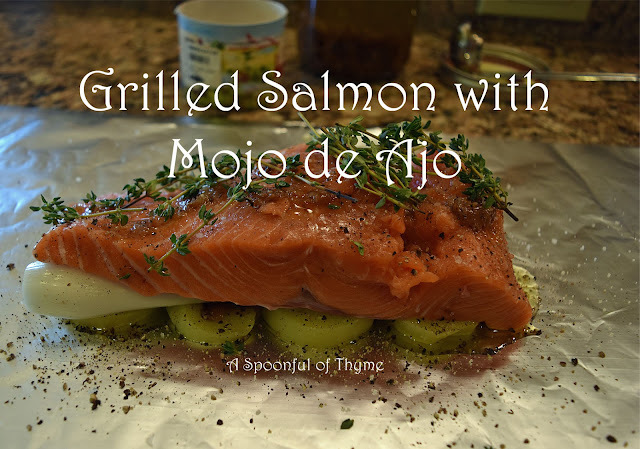 Thank you Aly, for sharing this delicious Mojo de Ajo and Salmon recipe!! I fear I would be drinking that stuff straight from the jar! But I'll bet it is also perfection on wild salmon or, indeed, any seafood. The whole meal looks outstanding and I've been looking for a good mojo recipe. I am all about that roasted garlic! I am going to try that soon! I love the look of that salmon. Great recipe for July's theme. Wow! That looks heavenly! I am really into marinades right now and I really want to use this! Roasted garlic is so delicious! With an endorsement from both you and Aly, I know I have to make this recipe. I can't wait to try your salmon this summer, Kathy! I really like the sound of this recipe and will be trying it very soon. Great choice! Kathy - the Mojo de Ajo is EVERYTHING! 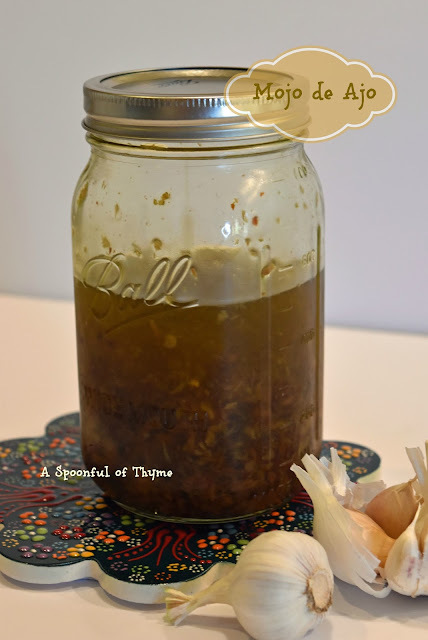 Seriously - I make a batch of this every couple of months and use that whenever I'm cooking things that need a bit of an extra garlic punch. Heck - as I'm thinking about it now, I have a fresh batch in the fridge and perhaps a grilled white pizza might be on the agenda this weekend. 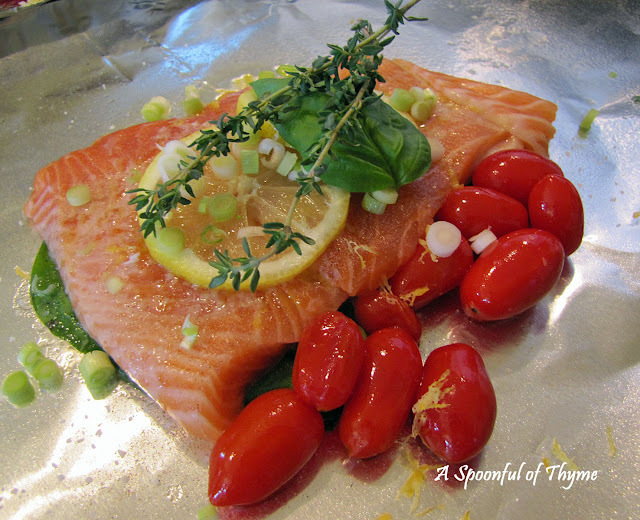 The salmon recipe is absolute entertaining gold - one of my absolute favorites!!! Thank you so so much for choosing two of my absolute must make recipes!! This will be making an appearance on my dinner table very soon…I love salmon and the Mojo de ajo sounds amazing. Great choice! I've never had mojo de ajo but I love the look and sound of it. Can't wait to make a batch of this liquid gold! I love Rick Bayless..his recipes are always delicious and I am sure that this was no exception. I am always on the lookout for Fish Friday recipes...thanks so much for sharing. Oh, my. Why have I never found this sauce????? Time to buy some fresh garlic! This sounds delicious! I might just have to add this to my menu plan next week. :) Now if only it would stop storming... but I suppose I could wing it in the oven, too.